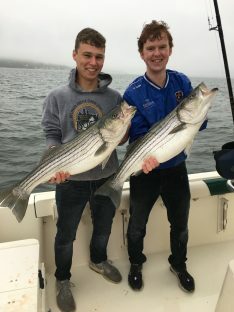 Free Fishing Reports > Northeast > New York > North Shore > Irish boy’s slam the Bass in Bad Weather !!! Irish boy’s slam the Bass in Bad Weather !!! James and Conor chose to go out for the red hot Bass bite, but didn’t realize what was in store for them !!! Refusing to dress properly or wear foul weather gear, the boys got cold and wet, but were rewarded with non-stop action for over an hour before leaving the fish biting for drier ground !!!! way to go boys, lets eat !! !